According to a new market report published by Transparency Market Research titled ‘IBM Bluemix Services Market – Global Industry Analysis, Size, Share, Growth, Trends, and Forecast, 2018 – 2026,’the global IBM Bluemix services market is expected to reach US$ 38,847 Mn by 2026. The market is projected to expand at a CAGR of 24.55% during the forecast period from 2018 to 2026. According to the report, the global IBM Bluemix services market will continue to be influenced by the increasing adoption of IBM Bluemix services across a wide range of end-users such as BFSI, IT & telecom, healthcare, media & entertainment, among others. Asia Pacific region is projected to be at the forefront of global demand, with the market in the region expanding at a CAGR above 26%during the forecast period. The global IBM Bluemix services market can be segmented based on application type into DevOps, application services, analytics, Watson, mobile, IoT, and others. These different applications of IBM Bluemix services have several benefits associated with them, which promotes their usage. For instance, DevOps services focuses on reduction of the downtime of redeploying applications so they are increasingly used for development of applications. The Watson segment is expected to expand rapidly as it allows the successful integration of powerful AI into applications developed by developers. Furthermore, IBM is introducing several services in the Watson and AI segments in order to stay ahead in the PaaS space. In January 2018, IBM announced a partnership with Mendix, a low code software platform. The partnership is expected to bring Mendix’s services to the IBM cloud, and the company plans to integrate them with its own tools. Through this move, IBM hopes to attract more users to its portfolio. In terms of end-user, the IBM Bluemix services market can be segmented into BFSI, IT & telecom, healthcare, retail, federal, media and entertainment, and others. The BFSI segment is expected to hold a significant market share, owing to the advent of emerging innovations in the portfolio of IBM Bluemix services. The healthcare segment is anticipated to expand at a CAGR of 24.89% during the forecast period owing to the efficient output generation from IBM Bluemix services that are being used by the healthcare sector. Based on deployment model, the IBM Bluemix services market can be segmented into dedicated, public, and private. The public segment is expected to hold a dominant share of the market and is anticipated to be a rapidly expanding segment. This is because the public deployment model offers nearly all functionalities with reduced cost, flexibility, scalability, and better deployment. Furthermore, the public deployment model is cheaper to use, which can be attractive to small scale industries and start-ups. North America is expected to hold a prominent share of the IBM Bluemix services market during the forecast period. This is mainly due to the booming IBM Bluemix services marketplace with the presence of well-established partners of IBM Bluemix across the region. Furthermore, North America is witnessing significant adoption of IBM Bluemix services by the continuously expanding IT industry. IBM Bluemix services are gaining popularity across Asia Pacific, especially in economies such as China, Japan, and India. Rise in awareness in the region pertaining to the advantages associated with the different services offered by IBM Bluemixis expected to fuel the IBM Bluemix services market in the region. China is projected to hold a significant market share owing to rise in the number of players in the region who are readily opting for partnerships with IBM and want to benefit from IBM Bluemix services. Tata Consultancy Services Limited, Infosys Limited, Capgemini, Robert Bosch GmbH, Datamato Technologies Pvt. Ltd., Prolifics, Inc., Tech Mahindra Limited, Perficient Inc., Wipro Limited, and DXC Technology Company are some of the major players operating in the IBM Bluemix services market profiled in this study. Details such as financials, business strategies, recent developments, product implementation expertise, key contracts, certified professionals, IBM Bluemix services offerings, and other such strategic information pertaining to these players have been duly provided as part of company profiling. The “IBM Bluemix Services Market – Global Industry Analysis, Size, Share, Growth, Trends, and Forecast, 2018 – 2026”, report provides analysis of the IBM Bluemix Servicesmarket for the period 2016 to 2026, wherein the years from 2018 to 2026 is the forecast period, and 2017 is considered as the base year. Data for 2016 has been included as historical information. The report covers all the trends and technologies playing a major role in the expansion of the IBM Bluemix Services marketduring the forecast period. It highlights the drivers, restraints, and opportunities expected to influence the expansion of the market during this period. The study provides a holistic perspective on the expansion of the market, in terms of revenue and volume (in US$ Mn), across different geographical regions, namely, North America, Europe, Asia Pacific, Middle East & Africa and South America. The report highlights the key trends affecting the market on a global scale. Furthermore, region-wise prominent countries/regions covered in the report include - The U.S, Canada, Germany, France, the U.K., India, China, Japan, GCC countries,South Africa, and Brazil. This report analyzes and forecasts the market forIBM Bluemix Servicesat the global and regional level. The market has been forecasted based on revenue (US$ Mn) from 2018 to 2026. The study includes drivers and restraints of the global IBM Bluemix Servicesmarket. It also covers the impact of these drivers and restraints for IBM Bluemix Servicesduring the forecast period. The report comprises a detailed ecosystem analysis, which provides a comprehensive view of the global IBM Bluemix Servicesmarket. The study encompasses market attractiveness analysis, wherein, end-users are benchmarked based on their market size, growth rate, and general attractiveness. 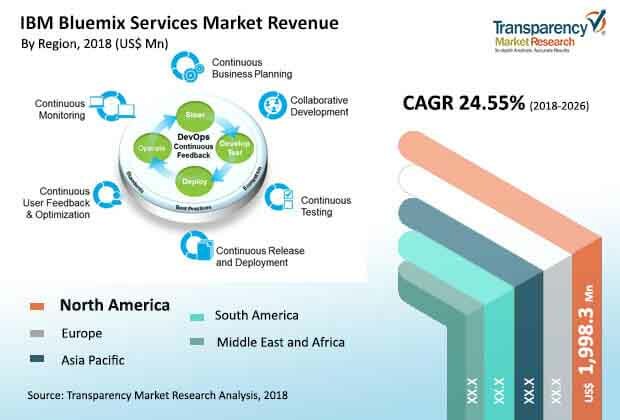 This research study on the global IBM Bluemix Servicesmarket provides a detailed cross-segment and cross-country analysis based on the different segments including application type, end-user, and deployment. Based on the application type, the market is segmented into DevOps, application services, analytics, Watson, mobile, IoT, and others.Based on end-user, the market is segmented intoBFSI, IT & telecom, healthcare, retail, federal, media and entertainment, and others. Furthermore, based on deployment model, the market is divided intodedicated, public, and private. Primary research involves e-mail interactions, telephonic interviews, and face-to-face interviews for each market, category, segment, and sub-segment across geographies. We conduct primary interviews on an ongoing basis with industry participants and commentators in order to validate the data and analysis. Primary interviews provide firsthand information on the market size, market trends, growth trends, competitive landscape, and outlook, etc. These help us to validate and strengthen secondary research findings. These also helpdevelop the analysis team’s market expertise and understanding. While arriving at the final numbers of the IBM Bluemix Services market, we have considered only the revenue generated by IBMBluemix Services’ partners’ revenue for the respective years. The report includes well-established playersoffering IBM Bluemix Services including Tata Consultancy Services Limited, Infosys Limited, Capgemini, Robert Bosch GmbH, Datamato Technologies Pvt. Ltd., Prolifics, Inc., Tech Mahindra Limited, Perficient Inc., Wipro Limited,and DXC Technology Company.